This weekend, seniors Becket Cerny, Matthew Forker, Harrison Nir, and Jake Rogers put on music thesis concerts, featuring original compositions, arrangements, and covers ranging in genre from jazz to rap to experimental music. 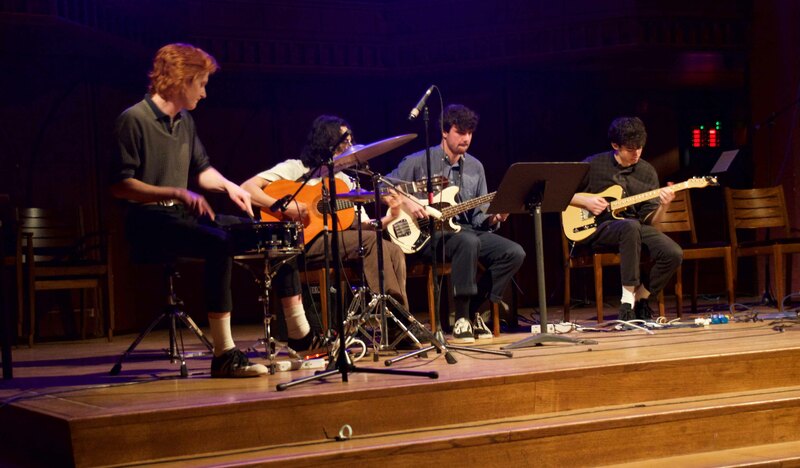 Rogers’ project, which took place in Memorial Chapel on Friday evening, included a couple original pieces and several pieces that he arranged, including an Elliott Smith song, a few more upbeat, jazzy numbers, and a bossa nova piece written by Brazilian composer Antonio Carlos Jobin and digitally arranged by Rogers. Rogers started off the concert with an untitled solo guitar mediation, setting the tone for a performance that was both incredibly solid instrumentally and dynamic in terms of genre. One of the standouts was Rogers’ original piece, “Speech/Selling Your Timber,” a spoken-word piece inspired by James Falzone’s “Ludus in Spectro.” The piece began with the audience picking random numbers, which then determined which words would trigger musical tones, along with text which was read by Meg West ’19 and then acted as an input affecting the pitch and duration of the tones. Another was Jerome Kern and Oscar Hammerstein’s “The Song is You,” which Rogers performed with Declan Moy Bishow ’19, Chris Reed ’19, and Jake Abraham ’20. The combo was incredibly tight, moving in and out of different written and improvised sections with ease and great energy and communication. Harrison Nir’s senior recital, “In Tel,” which took place in World Music Hall this Friday, took its name from the Hebrew word “tel,” which refers to a hill or mound of earth, especially one containing old ruins. “The whole piece was built on the theme of the Tel, on the material and geological accumulation of life,” Nir told The Argus. Of these, the first and last pieces took place in the main performance space on the ground floor of World Music Hall, but “Vireality” required audience members to move along with the musicians to the building’s lower level, where a screen played footage of Israel and Palestine, alternating videoclips of sweeping landscapes and peaceful skylines with scenes of military brutality and violent altercations. This footage was pulled from YouTube, but the voice recordings that accompanied it were taken by Nir himself, who conducted interviews and collected audio this past winter when he visited Israel and Palestine. Matthew Forker ’19’s thesis concert was a premiere of new jazz compositions and one arrangement by Forker himself. The compositions were performed by a septet consisting of Charlotte Babbin ’22 on the flute, Ben Lyon ’21 on the alto saxophone, Lisa Stein ’21 on the cello and vocals, Marvin McNeill GSLP on the trombone, Jolie Villegas ’22 on the bass, Jack Warnock ’22 on the drums and percussion, and Forker on the guitar. The compositions veered into experimental jazz and even more cross-genre music. The pieces were complex and dissonant at times, but the musicians did an excellent job of pulling them off. Forker will have his first album come out this summer, which he asked concert attendees to keep an eye out for. Also on Friday, in Beckham Hall, Cerny performed his senior music thesis, “Groove Science,” which centered around renowned record producer and rapper James Yancy (J Dilla). Culminating Cerny’s year-long study on J Dilla’s ’90s and early 2000s body of work, which spans R&B, jazz, hip-hop, and soul genres, the performance featured a selection of iconic J Dilla tracks, arrangements by other artists that Dilla influences, and Cerny’s own original compositions in the Dilla style. In aiming to treat Dilla as a composer, rather than just a beat-maker, as he is more often characterized, the thesis captured Dilla’s innovative style of making “phat beats” and tracking his influence on other artists such as Common, D’Angelo, Questlove, Erykah Badu, Kanye West, Karriem Riggins, and Bilal. With Cerny playing the drums, Alex Tripp ’21 on guitar, and Gabe Leeman ’20 on bass, the group launched into a J Dilla classic, “E=MC2,” from his album, The Shining. The group really hit its stride with D-Angelo’s melodic “left-right” before launching into a series of Cerny’s own original Dilla inspired compositions. Daphne Gampel ’19 and Laszlo Feher ’20 sang the vocals, complimenting one another’s distinct but different jazz and hip-hop styles on the performance’s variety of tracks and melodic shifts. Reflecting on the performance, Cerny appreciated the contributions of the students who helped him put the performance together and remarked on the new understanding of his music that he gained during the thesis process. Next week, several more senior music majors will be presenting concerts. Camille De Beus’ thesis performance will be Friday, April 12 at 7 p.m. in Crowell Concert Hall, Daphne Gampel’s will be Saturday, April 13 at 7 p.m. in World Music Hall, and Isaac Price-Slade’s will be Sunday, April 14 at 1 p.m. in Russell House. Luke Goldstein can be reached at lgoldstein@wesleyan.edu.